By isolating a merino wool interior and a synthetic fiber exterior Polartec® developed a hybrid fabric with distinct surface features to optimize wicking, breathability, odor resistance and durability. Wool's natural odor fighting properties are given a boost, and the unpredictability of shrinking and shape loss caused from washing is prevented through the resilience of synthetics. 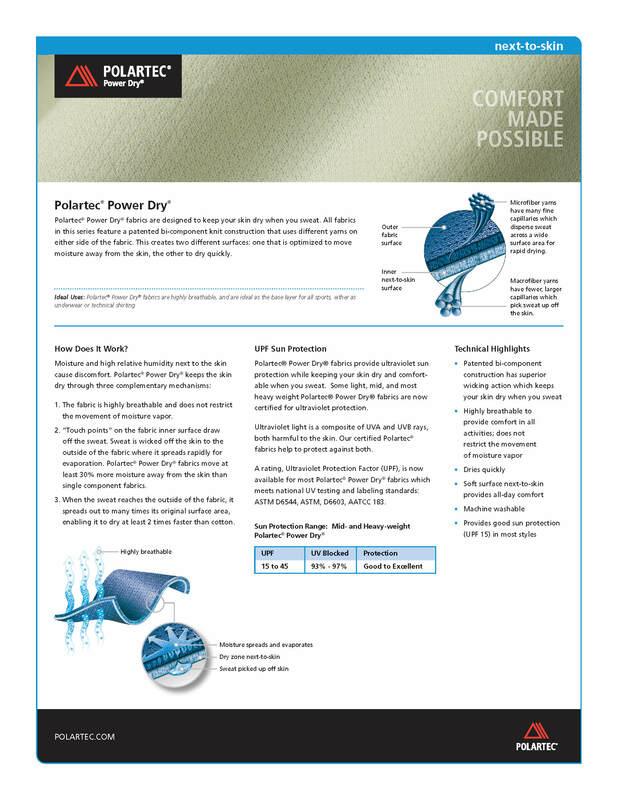 Polartec® Power Wool™ adapts to such divergent conditions that it can excel during a wide variety of performance activities and diverse environmental conditions. This performance ability to balance both breathability and warmth provides consistent comfort at all times. This soft, stretchy fabric isn't just the best technical underwear of the outdoor market, it is ideal for shirts and aerobic wear. It outperforms all next-to-skin fabrics on the market because its patented construction has two unique surfaces: the soft inner layer rapidly wicks perspiration away from the body, while the durable outer layer spreads moisture for maximum evaporation.